Fasten your seatbelts, folks. It’s going to be a long post. You can skip to the bottom for the recipe if you want, I won’t be offended. But if you do, before you do, here are the Cliff’s Notes: ramblings on Christmas fun, Happy New Year(! ), shame, perfectionism, joy, life lessons, resolutions or goals, and how I came to make these sweet potato, green chili, cheese tamales with tomatillo salsa. Okay–you are excused. See ya at the bottom for the recipe! Alright, diehards, here it goes. I am getting back to reality after a week of relaxing, both at home in Grand Rapids and in the Upper Peninsula, where I grew up. We spent the last week reading (Joseph Heywood’s Wood Cops series is awesome! ), snowshoeing (new snowshoes for Christmas! ), walking around historic downtown Marquette (we had a night at the historic Landmark Inn–what a treat! ), and hiking to see some beautiful ice caves about twenty minutes from where I grew up. I haven’t been to the ice caves as an adult and I feel truly blessed that I have someone who I can enjoy doing things with and that he digs checking out giant frozen icicles and other wonders of nature with his Yooper gal. I’m still bewildered that someone could enjoy the same things I enjoy as much as I do myself. Amidst all of that fun, I’ve been working hard to resist the urge to tackle the bazillion things on my to-do list. Sounds like a joke (who wouldn’t want to toss their cares aside and just enjoy some off-time? ), but it’s not. I’ve made a valiant effort to follow through on my promise to take a break from my constant frenetic pace. I’m going to be honest; it hasn’t been easy. I seem to struggle greatly with the constant feeling that I need to be productive in order to experience a feeling of self-worth. I feel like time slips through my fingers so quickly and feel a sense of loss every day and sometimes even panic at the feeling that I can never get ahead of the ball. I actually get angry at times, wondering why the day feels like it ends before it even starts and scolding myself for not moving more quickly on the tasks I complete in order to allow more time for other tasks. I feel a constant sense of anxiety over not being prolific enough, not posting enough, not working out enough, not having a perfectly clean house, not being daring enough to do something different and risky, not being able to fit everything in. And this all boils up into a huge ball of shame that sits in my throat and washes over me and tells me I’m not good enough. Sometimes that I’m not even just enough. The real shame here is that my personal feeling of inadequacy, of urgency, of failing and flailing prevents me from enjoying each moment and staying focused on the present and all that is good in my life. Thank goodness for a more present-minded partner who can call me out and implore me to snap out of it by asking questions like, “Do we have a wonderful home? Do we have everything we need? Do we have love? Do we have family? Do we laugh? Do we have a good life?” Even though I usually respond with a “Yes, but…..why can’t I just do more? Yes, but….why can’t I have x, y, and z other things that I want to be going on in my life right now, this instant? Yes, our house is wonderful but it hasn’t been vacuumed in two weeks”, the right answer to all of his questions is simply yes. And those things are enough. And then some. And that’s what I should be focused on. I understand that in order to “get ahead” I also need to push myself and work hard to create and complete. But at what point does it become not worth it? Over my short Christmas break I didn’t take time to cherish every moment but there were times that I was able to stop and enjoy my surroundings. The quiet of the snow-covered woods, the trickle of the stream under ice, the sharp, cold air filling my lungs, and the crunch of snow under my snowshoes. I also had moments of panic that I wasn’t doing enough and that I wasn’t using my time wisely. But progress, not perfection, right? In this new year, 2014, rather than set resolutions for myself, I’m going to try to set goals. Normally I have a big list of things I want to stick with for each new year but this year I didn’t quite get around to it. And that’s okay because my resolutions are usually all or nothing and go out the window in no time at all. When I have time and the inspiration to do so, I’ll create a list of goals for this year. Both short-term and long-term goals and dreams. In the meantime, I’m going to focus on starting out the new year with just one goal. To give myself a break. That means not beating myself up if I don’t accomplish everything I planned to do each day. That means resting when I am tired. That means taking time out to relax so I can refresh and tackle challenges and opportunities instead of feeling overwhelmed. That means letting go of some things so I can focus on what really matters. See below for illustration, if you aren’t sure what I’m trying to get at. One of the moments I relished this break (without feeling like I ought to be doing something else) was standing in the kitchen with my big brother making tamales. For Christmas, Gabe received everything he needs to start a tamales factory in the kitchen. Well, not quite, but he got a steamer, a spreader, masa, twine, husks, a tamales cookbook, all in all a comprehensive tamales toolkit. We jokingly pretended we were on a reality show called Top Tamale! where we were in a competition to make the most tamales and win on flavor in the meantime. Well, the productivity princess in me won on quantity but his focus on authenticity (including generous amounts of butter) won him the flavor award. Despite his winning on flavor, it was a close call and I felt that I developed a good compromise for the health-conscious among us. The tamales I made yielded flavorful results without the guilt of eating yet another calorie bomb over the holidays. I loosely based my tamales recipe off of Cooking Light’s Black Bean and Sweet Potato Tamales. Cooking Light also has a nice, simple photo illustration of the process of making tamales, which you can find here. If you are looking for a traditional recipe that uses pork but cuts the calories in half, try these Christmas Eve Tamales. Tamales are as loosely interpreted as you want them to be and the fillings can be whatever your heart and taste buds desire–they can even be made as a dessert! I wanted to make traditional vegetarian tamales with chilis and cheese but had leftover roasted sweet potatoes so incorporated them. The result was bright, slightly spicy, and finished with a touch of cheesiness and sweetness. For more ideas on tamales fillings, head here, look into your pantry, and let your imagination be your guide. While somewhat labor intensive initially, this recipe is a fun way to team up in the kitchen, either with your partner or with kids. And the best thing? You’ll have plenty of leftovers, which means more time to spend doing the things that matter with the people who matter. Place corn husks in a large bowl and cover with water hot water. Weight husks down with a large can; soak 30 minutes. Drain and cover with a damp towel to prevent from drying out. Preheat oven to 400°. Toss cubed sweet potato with oil, sprinkle with salt, and roast for 25 minutes until soft. Heat remaining 2 teaspoons oil in a skillet over medium-high heat. Add onion and saute until onion begins to soften, about 5 minutes. Add cumin and stir to combine. Add green chiles, tomatoes, and garlic. Stir in prepared roasted sweet potatoes. Cook until liquid is reduced and the mixture is scoopable, about 15 minutes. Add cilantro, stir, and remove from heat. To prepare masa dough, lightly spoon masa harina into dry measuring cups; level with a knife. Combine masa harina, baking powder, and salt. Add broth and butter or oil to masa mixture; stir until a soft and sticky dough forms. Cover. To prepare salsa, place tomatillos in a saucepan with water to cover and cook until soft, about 5 minutes. Drain and add to a blender with remaining ingredients. Pulse until it becomes a chunky salsa. To assemble, working with 1 husk at a time, place 3 tablespoons masa dough in center of husk about 1/2 inch from top, and press dough using your fingers into a rectangle shape. Spoon 2 tablespoons of filling mixture down middle of dough and top with 1 or 2 tablespoons of cheese. Fold husk over tamale, being sure to cover the filling with dough. Flatten slightly. If you are using just one husk, fold over 1 more time. Fold bottom end of husk under. If you choose to use two husks, as I did, wrap second husk around the first husk with filling, fold bottom end of the second husk, and tie with twine. Place the tamale, seam side down, on the rack of a tamale steamer that has been filled to the rack with water. Cover with a damp towel while you fill the remaining tamales. Repeat the tamale-making procedure with remaining husks, dough, and filling mixture. Cover tamale steamer with lid and steam tamales for 1 to 1 and ½ hours, adding water as necessary to maintain a depth of about 1/2 inch. 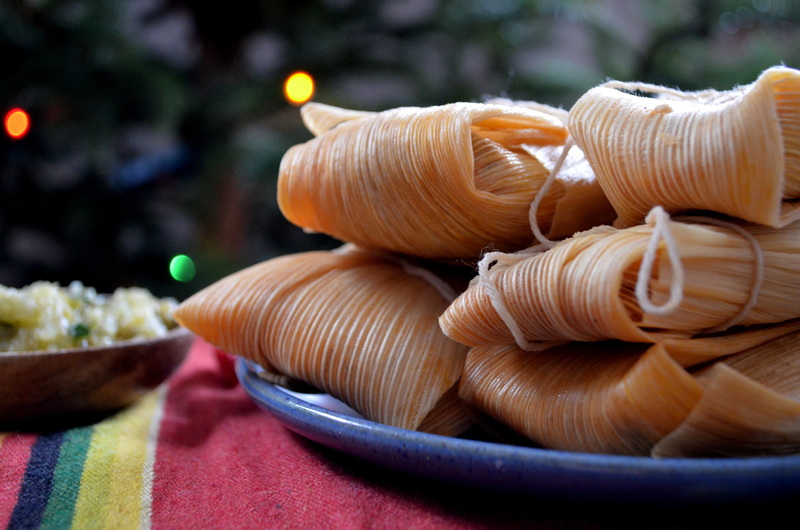 Tamales are done when they pull away from the husk as you remove it. If the dough is still sticking to the husk, return to pot and steam at 10 minute increments until done. Let stand 10 minutes. Serve with sauce. To reheat leftover tamales, simply add water to the bottom of a steamer pan and steam tamales for 15-20 minutes until soft. Not entirely honest, Drew. She omitted the part where I made tamales that looked like someone had run them over with a bicycle and was swearing liked a sailor while I tried to hold my tamales together with the string. Some things are best left untyped in order for the blog to remain family friendly, dear bro.